Just regular folks. : Going outside. We try and spend a little time outside whenever it's the weekend or a holiday. It's not always easy, especially when it's cold outside and people are sick (Jeremy) or like to nap (me and Edda). (Where's Vince? With his friends. Somewhere - we don't really know a lot of the time. It's a new world, where you don't exactly know every minute of the day where your child is. I mean, we know where he is theoretically. We just don't know know.) I really just wanted to read all day and doze and eat leftover turkey. But it's true that if we spend too much time in the house, we all get a little snippy at each other. So where to go when it's cold and we are all a little worn out? Just 20 feet outside into the backyard. 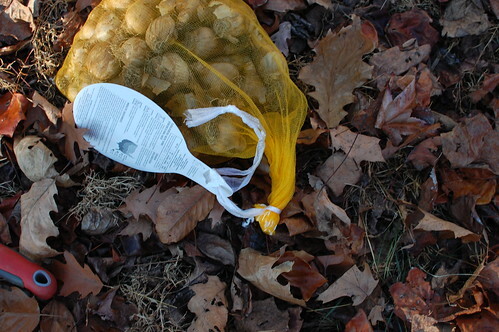 We planted about half of the 90 daffodil bulbs. I'm excited to see them from my office window in the spring. Edda's happy to be outside in the picture below - her smile is a little grimace-y. A bunch of my mom-friends (who I've known for about 5 years or so) are so fascinated when I tell them that when Jeremy and I met in 1994, he had seven earrings and a shaved head. They can't even imagine him like that, he's a pretty regular looking middle-aged white guy these days. Buys his clothes from Land's End and testifies in front of Congress in suits. 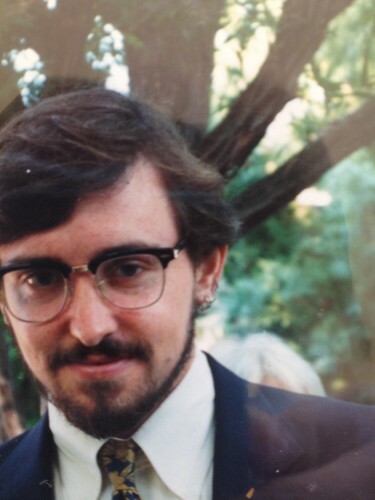 It's been so hard to find photos of Jeremy in the early 90s which show off the earrings. So finally, Kiki brought this photo from 1994, only a few months before we met. So here it is - so young! So young - I can't believe how long ago this was.